Isn’t it interesting that Watanabe suffers from stomach cancer? In Buddhism, and in Japan, the abdomen is the seat of the soul. To suffer from cancer there is to suffer from a cancer of the soul. 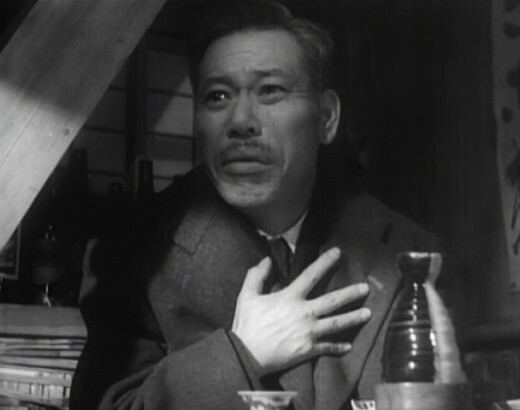 I find is strange and interesting that heart disease is the big killer in the west and stomach cancer was a big killer in Japan when the film “Ikiru” was made. Also, tuberculosis continues to be a problem in Japan, which is a bit surprising, since Japan enjoys the highest average life expectancy in the world. 1. Will Japan see a decline in average life expectancy with societal changes that place a higher value on youth? 2. There are approximately 30,000 suicides a year in Japan. With the continuance of rising stress levels, will those numbers rise? A good point, Coco. If I’m not mistaken, the abdomen used to house some important areas of metaphor also in English, but at some point this changed. In this sense, it is really an “illness of the soul” that Watanabe has. This is actually something that also Prince talks about in his commentary track. By this Watanabe appears to suggest that, really, it is not his stomach but his heart that is aching. I don’t know enough about the Japanese system of metaphors to interpret this in any meaningful way, but it seems that the heart is important also for the Japanese. To answer your questions the best I can, I don’t personally think that the average life expectancy will drop in Japan. “Youth” doesn’t always correspond with age, and that I think is especially true in Japan where so many people over 70 seem so young, so vital and so energetic! The rate of suicides may go up, but I would imagine that it will then also come down, once the stress levels drop. It is actually interesting how little time Ikiru spends in dealing with the fact that also Watanabe contemplated suicide. The pills are there, as is indirectly also the admission, but we are never shown him thinking about it. Somehow I have the feeling that the possible Hollywood remake may differ in respect. From my limited medical knowledge, stomach cancer was always traditionally the biggest killer of all, especially in Japan. It is essentially a disease caused by the consumption of too much preserved (pickled, smoked) food and insufficient fresh fruit and veg. Ironically, its the globilisation of food production that has made it a rare disease in the west (it was once the number 1 killer) – but its the one area that the famously healthy japanese diet fails on.
. Will Japan see a decline in average life expectancy with societal changes that place a higher value on youth? despite its huge cultural importance. Seems like half the characters in Murakami novels top themselves eventually. While its higher than most European countries, its actually not by a huge degree. I suspect that the difference is even less if you take account that in many countries (including my own), the authorities are always reluctant to call a death as suicide, unless its absolutely unequivocable. Yes, Ugetsu, and think of Kawabata! Such huge cultural importance! I am so surprised that the suicide rate then, is low! Come to think of it, it is strange that Watanabe clutches his heart…. I tried to do some reading into this matter, but with no proper access to online or offline libraries, I just came out more confused than before. From what I now understand, the Japanese metaphorical map of the body seems pretty complex. Not only do you have terms like hara (literally ‘belly’), kokoro (‘heart’) and atama (‘head’), but then these are complimented by various other ideas such as ki (‘breath’, and something of a life force), kao (‘face’), mushi (a worm in the gut), and many others. William Gudykunst (Gudykunst, 62-66) paints a similar picture. Also he places “sensation, feeling, emotion, psychic energy, desire” to kokoro, while saying that hara “refers to a person’s inner state of mind, disposition, emotion, or intention” (emphasis mine). Gudykunst also makes an interesting point about hara being associated with the breath, while kokoro has more to do with blood. Unfortunately, the Google Book preview does not allow me to read onto page 67, where Gudykunst would, it seems, discuss atama. I found further discussion of these matters in Marsella & White, but it only confused me more. There is also a linguistic analysis, the abstract of which seems relevant, but I don’t have $33.75 + taxes to put on a paper, especially when my past experience of linguistic analyses based on Anna Wierzbicka’s work in semantics has been highly mixed. In any case, if I grasp anything, it would seem that while both have to do with similar qualities, the distinction between hara and kokoro is that hara is more personal or private, whereas kokoro is more response-driven, or external. The problem is that this quite strongly fails to explain to me Watanabe’s assertion that it is not his stomach (hara) but his chest (kokoro) that hurts. Considering the above, it just seems to make no sense. Or does it? It is possible, indeed probable, that I simply do not understand the hara/kokoro division. Yet, it is at the same time interesting that Watanabe’s reaction makes perfect sense when it is looked at from a Western perspective, where a stomach is just a stomach, but a heart is something far more than that. Knowing as little as I do about these matters, it is really difficult to say anything definitive. Yet, could it be that here, like in so many other places in the movie (see my Nippon Beer post), the movie is actually mixing Japanese and western metaphors? But if this is so, why would Watanabe be rejecting the Japanese metaphor in favour for the western one here? That doesn’t really make sense to me, either. Are there any lurkers who have a good grasp or understanding of the symbolism of the body who can throw light on this? The real value of these conversations are the light they throw on otherwise unnoticed bits of film-revealing potential meaning. Thanks, Vili, for the screen capture of Atanabe clutching his heart. I looked at that scene again over the weekend. Watanabe is asked directly by the writer if his stomach is hurting…but Watanabe clutches his his heart-this is in direct relation to the question about family. Watanabe’s difficult relationship with his son is on his mind, and his heart-that much is clear. How this relates to larger Japanese concepts of the seat of emotions, mind and soul, is still not quite clear to me. Guessing, though, that Watanabe, as a petty bureaucrat (not unlike myself)-he represents older, established ideas, not “new-fangled” western ideas. I have an east-west book of symbols in art, but there’s not much about how the heart is viewed in Japan…I probably should purchase this book : Symbols of Japan.